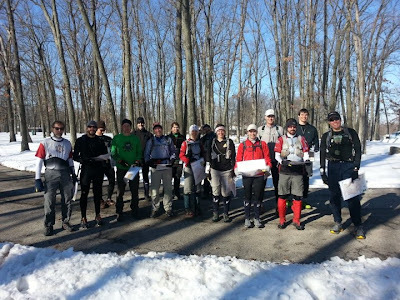 While a good chunk of my friends were riding the annual Death by Hills, I made the decision to torture myself on foot by participating in the Gateway Grunt, a long-course orienteering race held every spring by St. Louis Orienteering Club. The meet is organized by my friend Bill who was kind enough to introduce me to adventure racing way back in 2009. He is an excellent orienteer and always sets a tough course at the Grunt. This year would be no different - we were starting at the Greensfelder Visitor's Center and using both Greensfelder Park and Rockwoods Range for terrain. These two parks are some of the hilliest in the St. Louis area and we would be covering about 20k of ground. And if the terrain alone wasn't enough of a challenge, we just had a winter storm dump about 6" of snow so the going would be sloggy. Sign me up! I think the weather kept some competitors snug in their beds, but I knew that Rachel from Bushwhacker would be really tough to beat, and I always like running against the boys to see how I stack up. The race was set up on two maps, and we could pick 2 controls to skip on each map (consecutive skips are allowed). 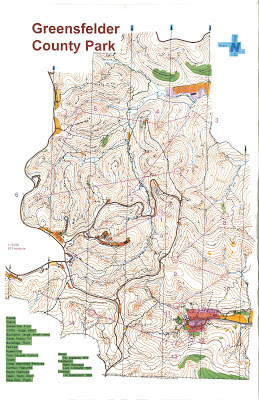 The entire first map at Greensfelder, before gps track overlay. My route for CPs 1 through 7. We start out on the Greensfelder map which was 1:10,000 and 20ft contours. I take a quick glance at the map, decide that the road is a perfectly acceptable route to CP1, and take off following Jeff S, Jeff R, and Josh. I use the long road run to evaluate skip options and decide on CP8 and CP10 (CP6 is mandatory, otherwise that would have been a great option). The road is covered in snow, but my Cascadias are doing a decent job of finding traction on the crusty surface. As the four of us are approaching CP1, we see David pop out of the reentrant, having taken a more direct route and beaten everyone to the control. Sneaky! I take a low route to CP2 and manage to gain a little time on him, but that's the last I'll see of the lead pack all day. 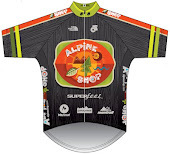 My route to CP3 is directly over the main ridgeline and my legs are no match for the boys'. I'm by myself here and just trying to keep a solid pace on the climb and then zip downhill. I hit CP3 pretty easily and then choose a semi-around route to CP4. I think I see Rachel behind me here so I really try to hustle to CP5 and end up catching my friend Mitch just after the punch. This is awesome because I have a friend to run with to CP6. This is terrible because I have a friend to run with to CP6. We punch 6 together, I flip over my map, and discover I have no plan for the very long leg to CP7. While we were chatting on the road run, I should have been evaluating route choice options. Instead, I make a snap decision to just go redline, while Mitch chooses the low route. He is smart, because my route to CP7 takes for-e-ver. It's not called the Grunt for nothing. My only motivation on this leg is that I can take my first skip after punching CP7 - I reclimb a little bit and then have a really fast road to run on to CP9. Then I take my second skip and it's on to CP11. This one is going really well until I stop descending the large spur a little too early, and get caught up by the sight of some Camp Wyman outbuildings, which are out-of-bounds (indicated by the purple hash lines on the map). I am very worried about violating the out-of-bounds so I am too conservative here, tracking westward just above the creek bottom looking for the control. The two reentrants/streams tell me I'm off my line, so I retrace my steps and sure enough, find CP11 sitting innocently in a small depression. According to my gps track that was about an 8 minute error. I am still a little freaked out about staying in-bounds so I take a way-wrong route to CP12. Just as I'm climbing the reentrant, I see Rachel leaving so I'm motivated chase after her. Except, after I punch CP12, nothing is matching up with the map. There are too many trails, too many reentrants, and none of them have control flags in them. Argh!!! I run around for a while before it dawns on me - I didn't punch CP12. I punched CP13 instead, by mistake. So I run back to the control flag to check the code - sure enough, that was 13, so I backtrack even further to the real CP12, punch, sprint to CP13, re-punch, and then get out of the confusion as fast as I can. In post-race analysis, that mistake cost me 25 minutes. 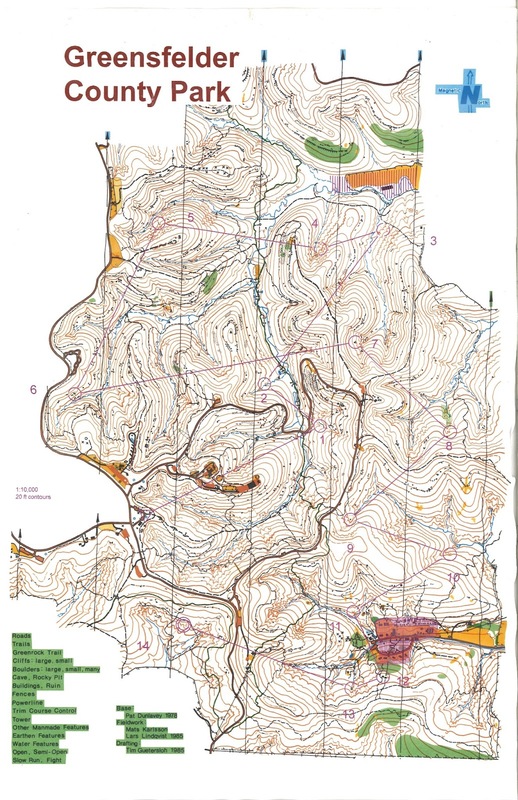 It's time to go to CP14, which will be the same as CP1 on the new map of Rockwoods. I climb out of the big reentrant with Melissa and Andrew, and on the way eat an entire Clif bar. After two back-to-back mistakes, I need a serious intervention and I'm hoping the extra calories will do the trick. Here is the un-gps-tracked Rockwoods Map. My route for CPs 1 through 9. I spend a few extra seconds at CP14/CP1 flipping my map and taking stock of my skip options. I hear a crowd barreling down behind me and it's Melissa, Mitch, and Andrew. Yikes! Time to boogie! 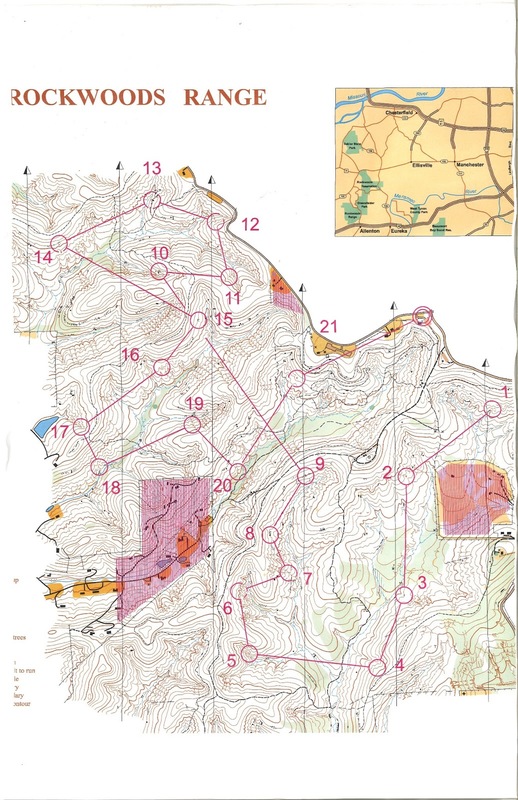 For some reason, this Rockwoods map looks clearer to me and the route choices are more obvious - redline redline redline with only a few small deviations to catch a few meters of trail here and there. The woods are pretty open and every once in a while I see a track of shoeprints that reassure me I'm on the right bearing. This are just flowing and I am hitting everything cleanly. I haven't seen my friends since CP1 and that is a good thing, but I'm also not catching anyone (namely Rachel) who is ahead of me. I am very powerfully drawn back into the mindset I experienced racing at Berryman with GearJunkie/WEDALI. We were behind Bushwhacker (ironically, Rachel's team) by about an hour and had to push really hard to catch them. I am in the same spot, except with no teammates to rely on, I start my own mental cheering section. My legs are really tired but my mind convinces them to stay engaged and go to work. We slog on, punching CP9 cleanly and preparing for the long leg to CP10. My route for CP9 to the FINISH!! The route to CP10 passes directly through CP15, so I take the opportunity to scout that control. I am a little discouraged - there is a veritable highway of footprints leaving CP15 and heading in the direction of CP16. Crap. This means there are a lot of people in front of me. I try to push that thought to the back of my mind and stick to my plan. At this point I've decided to skip CP17 and CP18 consecutively, mostly to cut out distance towards the end. CP10 goes well, CP11 has a minor mistake when I overshoot the control by about 50m, but it only sets me back a few minutes and I'm back on track. I've run out of water by now, but CP12 is a water control that is perfectly timed. I punch and take a few seconds to drink from the gallon containers dixie cups provided. On the way to CP13, I also find an 8-ounce water bottle that someone has dropped in the woods. Bingo! Exactly what I needed to finish this course strongly. I think I am most proud of my nav to CP14 - I just nail it. I take a few minutes to congratulate myself and then buckle back down. In the past, some of my biggest nav errors have come directly after triumphs like CP14. I remind myself sternly of that fact and execute a clean route to CP15. On the way, I pass 2 orienteers who are on the Runt course. They motivate me to run up the hill because they are walking. After punching CP15, I am finally able to join the highway of footprints to CP16 and then I see a few who took my same skip options and went straight to CP19. Coming down onto CP20, I see another person out in the woods, and I feel a huge burst of competitiveness that is rare for me. But it's also exciting to have a race on my hands after spending so much time alone in the woods. He punches CP20 about a minute in front of me, and then we work together to CP21, which is a tricky little pit that I'm relieved to spike. After that, it's just one more climb up to the road and then a sprint finish. After almost 5 hours of running, there is no way I'm going to be beat to the line, so I take off and bury myself uphill. My competitor drops back and I'm relieved to be able to push to the finish control on my own terms. I finish in 4:53:02 officially. The course, before skips, was 22.1km redline. I think my skips took about 4.5km off, so my total redline distance was 17.6km, which is almost 11 miles. With my route choices and mistakes, I covered almost 17 miles (according to the GPS track) in the woods. The real crusher, however, was the climb...the Garmin said almost 4,000 feet. Jeff went to the (nerdy) trouble of counting contour lines and came up with closer to 4,900 feet. That is a lot of climb. I think Bill said it best in his AttackPoint log..."There are exactly zero small hills in Greensfelder." and my quads couldn't agree more. OK, sure, it's not the almost 8,000 feet that some jerks climbed on their bikes, but still, it's a lot. I started the recovery from this effort by eating a baked potato covered in chili, along with at least a dozen cookies that SLOC had provided at the Visitor's Center finishing area. Deeee-licious. Oh, and Rachel beat me, by about 5 minutes. David won in 3:56, Jeff R was second in 4:24, Jeff S was third in 4:38, then Rachel in 4:48 and me rounding out the top 5 overall in 4:53.